Mike Bieser helps a child at Allenton with a chess puzzle. 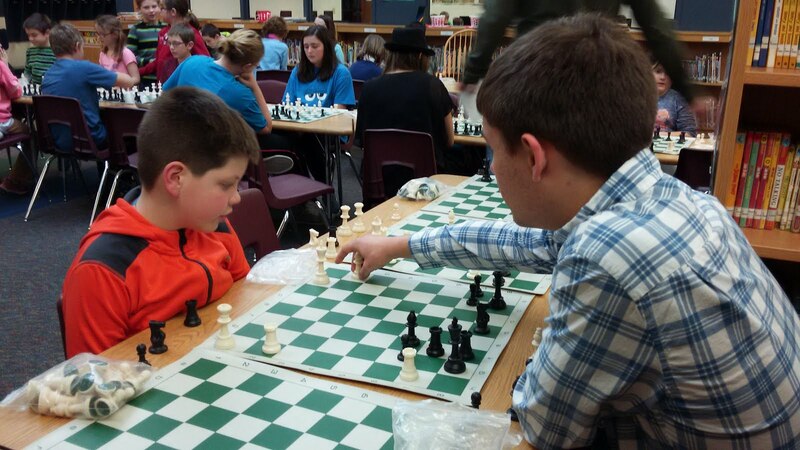 Last year, an announcement was made at Slinger High School that urged any chess fanatics to come in after school and join together in playing a game that’s centuries old. At first, chess club was incredibly small, but has since grown to a reasonable size. The head of Chess Club, Greg Sydow (who some may also recognize as the varsity soccer coach), appears to have spent his life teaching people how to play chess, because not only are his skills in the game highly competent, he’s an even better teacher. Which is why it’s shocking to find out he’s been teaching for only 18 months. Mr. Sydow was taught interested in chess as a child, but was never really taught much of anything other than how to play the game. While in college, Mr. Sydow began take chess more seriously. He learned and worked hard at it until he became the skilled chess player he is today. However, he knew that if he had been taught chess at a young age to begin with, it would’ve been easier to pick up on. So, Mr. Sydow decided that if he had the opportunity to give kids the knowledge he hadn’t been given as a child, he would do it. And so, Slinger High School gained a chess club. This year, Mr. Sydow was offered to teach at a chess program in Allenton Elementary, and he took it. Knowing the influence that older kids have on younger ones, (if a young child sees a “big kid” doing something, they want to do it too) he invited Slinger High School chess club members to come over and help him out over at Allenton. Mr. Sydow hopes that everyone in chess club--both in Slinger and Allenton--take away an important life lesson from playing the game. When someone says “I’m not good at chess” or “I can’t do that” is permanent, and Mr. Sydow hopes to teach everyone that it’s not permanent. By teaching chess--a difficult game that’s centuries old--Mr. Sydow hopes to inspire the confidence that the students need to approach a challenge with a “how can I get better?” attitude, and can smile straight through a mistake.